Abstract—The implementation of electric drivetrains into passenger vehicles is one of the promising ways for the automotive industry to reduce CO2 fleet emissions. The most important aim for the current developments is to increase range and performance while assuring affordability for the customer. In the field of electric motor development for traction applications, great efforts are necessary in order to improve electrical machines in terms of efficiency, power density and costs. The optimization of each individual field is a subject of research. Typically, there is a conflict of interest in simultaneously optimizing efficiency, power density and costs. This work presents a new approach to optimize the three fields for electric traction motors. The new approach combines an efficient direct cooling concept with the possibility of using lightweight polymer composites for the electric motor housing. The cooling concept increases the efficiency in a wide range of operation while enabling a high maximum continuous power output from the motor. To estimate the potential of the used cooling topology, the winding is optimized for using stator slot cooling. The electric motor is thermally simulated to verify the concept. These findings are used to design the cooling channels. Finally, a molded prototype stator is built and the newly designed concept was validated in a component test setup. The direct cooling with its short thermal path between the area of heat generation to the cooling system, enables the use of thermally insulating thermosetting composite materials for the electric motor housing. In this work the feasibility and potential of manufacturing the stator housing of an electric motor in an injection molding process is investigated. 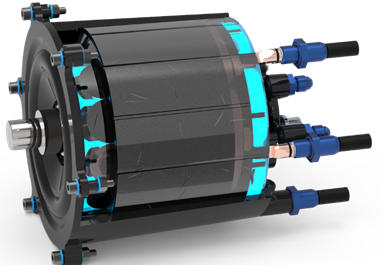 The design freedom of this manufacturing process enables complex and extensive functional integration such as the direct incorporation of the cooling channels in the stator slots, the phase connectors and the coolant supply.